Troodos Geopark is located only 30km away from the center of Limassol and is a sanctuary of peace, fresh air, waterfalls, forests, flora and fauna which are unique on the planet. The genesis and emergence of Troodos and Cyprus constitute a miracle of nature geosciences, history and myth! Discover the Green Heart of Cyprus, with the special Troodos Bus No 64, which departs from strategic tourism points ( Pizza Hut @ Dasoudi Beach, Old Port-opposite to Ayia Napa church & Old Hospital in Limassol) and visit Platres Resort with the Rope Adventure Park, Lavender Thematic Center , Chocolate workshop and historic hotels and two breath taking waterfalls, Millomeris & Kaleidonia. Indulge yourself with fresh trout from the trout farm or have lunch at one of the local restaurants and coffee shops. If you want to go higher, the Troodos bus can take you at Troodos square to enjoy the view and the breeze from the highest point in Cyprus located 1,700 m above sea level , and enjoy many activities such as Hiking, Nature Trails, Cycling , Horse Riding and learn about the formation of Troodos and everything that lives in the Geopark at the Troodos National Forest Park Visitor’s Center, a few meters away from the main square. 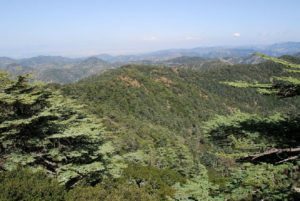 Final stop is the Troodos Botanical Garden, where you can get acquainted with the 700 different kinds of herbs that Troodos is blessed with, visit the Troodos Geopark visitors centre , stroll around the lake and have a relaxing picnic at the picnic area. 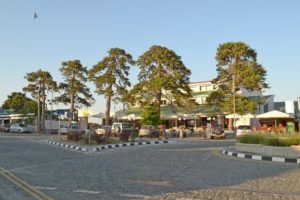 The bus will wait for you there for then take you back to Troodos square where you can enjoy all the above until 16.30 and then return to Limassol via Platres . If you are a cycling lover, you can take your bicycle with you. WELL ANOTHER NEWSFLASH FROM ARCHANGEL MICHAEL HOSPICE! !